How to make a heritage scrapbook... It's not that different from any other scrapbook, but you may have to do a little more research for your journaling, so let's start there. #1 - Who... What is this person's full formal name (first, middle, last [maiden])? If you are researching a female, be sure to get her maiden name if she is/was married, as all records prior to her marriage will be under her maiden name. You also want to determine whether this individual is a "Jr., III, etc. ", as that could be a determining factor when reviewing certain records. Who are they in relation to you (uncle, great-grandfather, etc.) and what side (maternal or paternal) are they on? Do they have any nicknames (e.g., they always go by Bill even though their name is William). Is this relative named after anyone in particular? If so, you could make a layout featuring the person and the individual they are named after. When was this person born and when did they die (if deceased)? If this person is part of the first generation in the country, when did they arrive? Where was this person born? 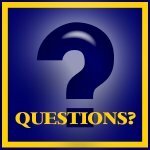 Where did they die and where are they buried (if deceased)? Where did they get married? Where did they get baptized? Did they ever live in other towns/countries? The one thing to keep in mind is that you get as much detail as possible about the location. Not just the city and state, but the county (parish) and country. For specific events (marriage, baptism, etc. ), make sure to get the church and/or cemetery name. For cemetery records, some people go to the extent of getting the exact plot location. As you can see, these are very similar to the "Five W's" that you can help build the framework and journaling for your heritage scrapbook. Now, to complete your heritage scrapbook, you will combine the answers to these questions with the photos of your ancestors. In order to make things manageable, take the first page or two of your heritage scrapbook and replicate the portion of the family tree that you will be covering (and how it connects to the others). The 12" x 12" sketch below is an example of a page that you might use for your Mom and Dad or any other couple. The two primary pictures are your parents, the pictures in the upper corners are their parents (your grandparents) and the pictures on the lower portion of the sketch are you and any siblings. 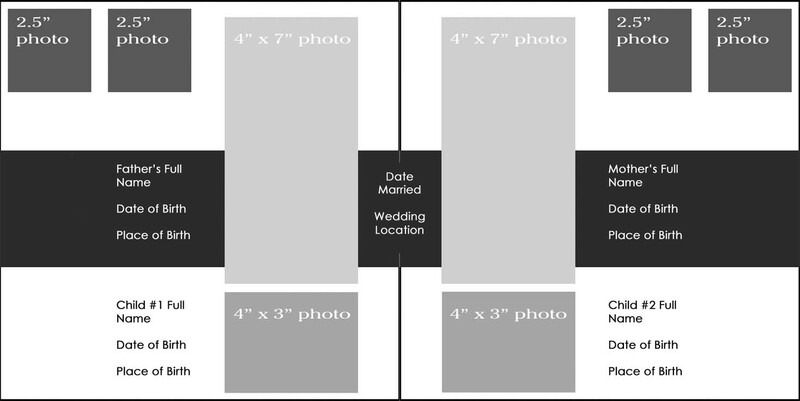 NOTE: If you have a lot of brothers and sisters you may want to incorporate some sort of flip book into the layout, so you don't sacrifice space for information about the person in an attempt to capture the entire family. For each person, you can also include any type of information that you want – hair color, eye color, likes/dislikes, etc. A lot of people will stick with blacks, tans and browns when working on heritage scrapbooks because it "fits" the theme - they want their scrapbook to look like an old book. You can obviously take this approach or you can get more creative and modern approach by using vibrant colors (especially if you are using solely black and white pictures). If you have any other questions on how to make a heritage scrapbook, don't hesitate to drop me a line.